Learn why Bermuda has been voted the ‘Shipwreck Capital of the Atlantic’. Take a 4.5 mile cruise out to Shipwreck Alley and prepare yourself for an unreal experience. Our experienced and knowledgeable crew will share stories about each wreck. Snorkel over Bermuda’s most valuable treasure, our vibrant and pristine coral reef. Examine some of our historic shipwrecks and enjoy schools of fish surrounding you. Once you’ve had your fill, hop back on board and enjoy sunbathing, jumping off the top deck, and a cash bar until it’s time to motor back home. Snorkel gear and instruction provided. 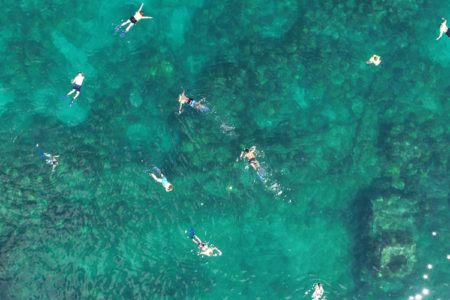 *We recommend this tour for more experienced and confident swimmers/snorkellers. It is located in 25+ feet of water and is several miles offshore. Anyone wishing to enter the water on this tour MUST know how to swim.